2. HEATING-RSISTINT, EXCELLENT ELECTRIC PROPERTY. 1. CLEAN THE CYLINDER SURFACE BEFORE FIXING, SUCH AS OIL CONTAMINATION AND DIRT. 2. SET THE SPARK PLUG ONTO THE CYLINDER HEADAND, TIGHTENNING AND KEEP THE SPARK PLUG TO TURN 90°~180°. PLEASE KEEP 30°~45°IF YOU HAVE REPLACED IT MANY TIMES BEFORE. 3, MAKE SURE SPARK PLUG RIGHT INSTALLATION. SPARK PLUG HOUSING BREAKS IF TOO TIGHT WHILE MOTOCYCLE SHAKES IF TOO LOOSE. This is just one of our motorcycle spark plug series. We guarantee to supply custom motorcycle spark plug if you can kindly offer detailed data. 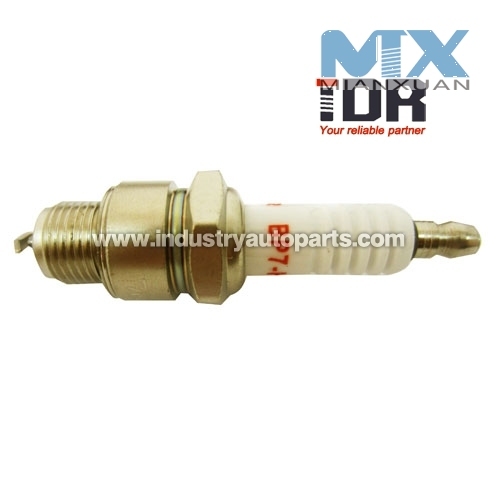 For motorcycle spark plug, also all other motorcycle accessory parts, we have broad plants and stable source.